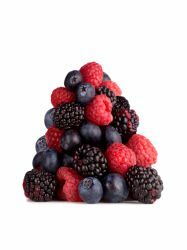 Is fructose malabsorption part of the IBS puzzle? Fructose is a type of sugar found in fruits and some vegetables. Some research has looked at the role that ingesting foods that contain fructose has on unpleasant digestive symptoms. Although quite limited and preliminary, the initial data is worth taking a look at if you suspect that fruits are be contributing to your intestinal distress. The symptoms of fructose malabsorption, formerly known as fructose intolerance, are digestive discomforts after eating or drinking food or drinks containing fructose, the sugar found in many fruits. The condition is thought to be the result of fructose not being fully absorbed in the small intestine. The fructose then makes its way into the large intestine where it is set upon and fermented by intestinal bacteria. This process can affect GI motility and contribute to unwanted gas and bloating. Some people with fructose malabsorption can tolerate small amounts of fructose, but symptoms occur when too much fructose is ingested in too short a period of time. For some individuals, fructose malabsorption may be the result of small intestine bacterial overgrowth (SIBO). The identification of fructose malabsorption is a key component of the theory behind the use of a low FODMAPs diet for IBS. Fructose malabsorption is a markedly different condition than hereditary fructose intolerance, a genetic disorder typically diagnosed in infancy. The hydrogen breath test might be done, measuring the amount of hydrogen in the breath following the ingestion of a fructose solution. An increase in hydrogen is believed to indicate that the fructose in the solution has been fermented by bacteria in the large intestine. However, the hydrogen breath test is not completely reliable. It can show a positive result even if the person doesn't have malabsorption. While some reviews say it is valuable, others point out its unreliability. Small intestinal bacterial overgrowth (SIBO) is another possible diagnosis when the hydrogen breath test is positive, and the doctor must determine whether that is the proper diagnosis rather than fructose malabsorption. One study made a comparison between healthy individuals and people who were self-identified as suffering from fructose intolerance based on the fact that they experienced bloating and flatulence after eating certain fruits. Although the results must be interpreted with caution due to the extremely small number of individuals (8 patients, 4 controls) who participated in the study, the results are interesting. The self-identified patients had higher hydrogen levels and did experience more bloating and flatulence as a result of drinking the solution than did the healthy individuals. The finding that test subjects experienced symptoms from the fructose solution itself was replicated in another study, one that used a much larger population. A total of 183 individuals who had unexplained digestive symptoms participated. Three-quarters of these individuals experienced abdominal symptoms following the ingestion of the fructose solution. These symptoms included flatulence, abdominal pain, bloating, belching and a change in bowel habit. One study looked specifically at fructose intolerance in adults diagnosed with IBS. Of the 80 study participants, almost one-third had a positive hydrogen breath test result following ingestion of the fructose solution. Of these patients, 26 participated in a follow-up assessment one year later. On follow-up, 14 of these patients reported that they were able to comply with a fructose-restricted diet and experienced significant improvement in the symptoms of pain, belching, bloating, indigestion and diarrhea. The difficulty with fructose is one of the key findings behind the low FODMAPs theory for IBS. This theory has received significant research for its effectiveness in reducing IBS symptoms. Research on the role of fructose malabsorption in IBS is still in its preliminary stages. However, if your symptoms of gas, bloating and diarrhea seem related to the ingestion of fruits, a fructose problem might be something to consider. Keep a food diary for several weeks to determine if there is a such a relationship. If so, speak to your doctor about the possibility of taking the hydrogen breath test and ask your doctor’s opinion about trying an elimination diet. Food Allergies and Intolerances 105: Fructose Malabsorption. American Gastroenterological Association. Choi, Y., Kraft, N., Zimmerman, B., Jackson, M. & Rao, S. Fructose Intolerance in IBS and Utility of Fructose-Restricted Diet. Journal of Clinical Gastroenterology 2008 42:233-238. Fedewa A, Rao SSC. Dietary Fructose Intolerance, Fructan Intolerance and FODMAPs. Current Gastroenterology Reports. 2013;16(1). doi:10.1007/s11894-013-0370-0. Mann, N. & Cheung, E. “ Fructose-induced breath hydrogen in patients with fruit intolerance.” Journal of Clinical Gastroenterology 2008 42:157-159. Yao CK, Tuck CJ. The clinical value of breath hydrogen testing. Journal of Gastroenterology and Hepatology. 2017;32:20-22. doi:10.1111/jgh.13689.